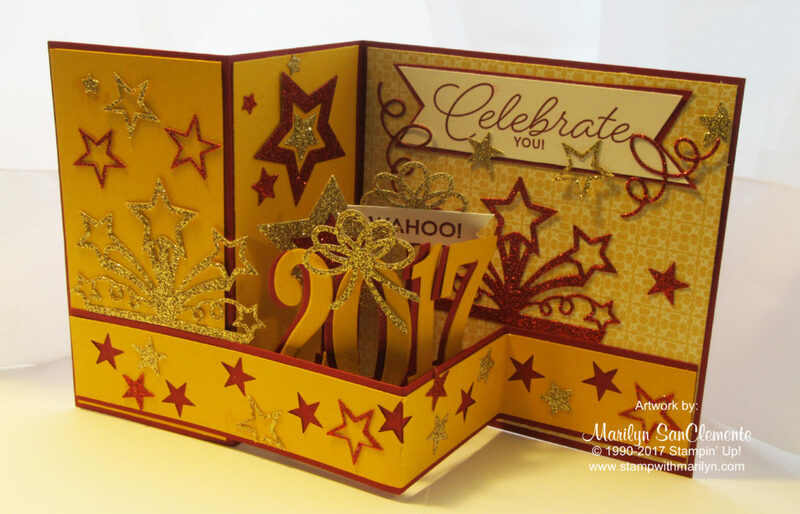 Marilyn SanClemente May 18, 2017 May 18, 2017 3D Item, Big Shot, Cards that Move, Graduation, Graduation card, handmade card, Handmade cards, Stampin' Up! Today I am sharing a handmade Z Fold Graduation card that I made for my daughter this past weekend! I am so proud of my baby girl (now 21). She graduated with a degree in Biology and a minor in Chemistry from Sacred Heart University on Sunday. She has been accepted into a Masters Program at Case Western Reserve so is moving to Cleveland, Ohio at the end of the summer… Eventually she wants to go to Medical school. Anyway, back to the card. I choose the colors of Cherry Cobbler and Crushed Curry since Sacred Heart’s colors are dark red and yellow – along with gray. 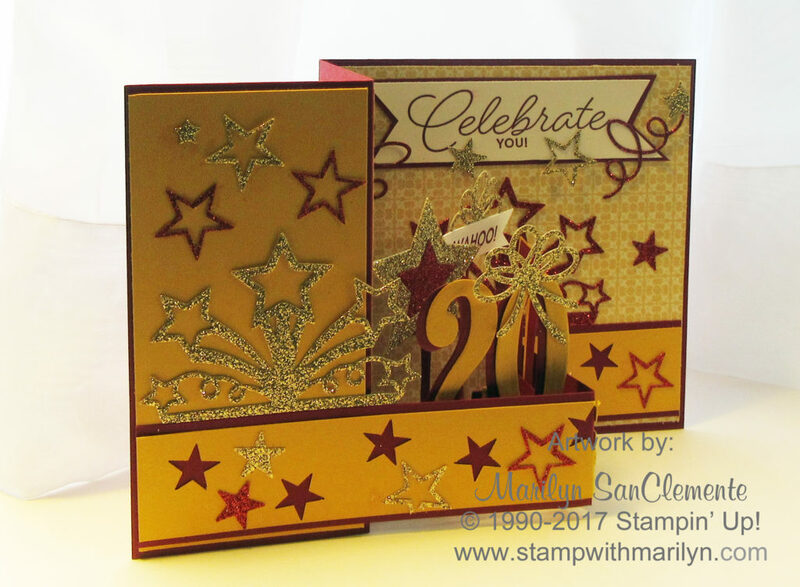 This card uses the Stampin’ Up!’s Birthday Blast stamp set with the Star Blast Edgelit dies. But hurry and get your copy of this set. This set is retiring and will be gone at the end of May! I also used the Star framelits to cut out extra stars. The numbers are cut out with with the Large Number Framelits. The Star Blast framelit was used to cut out an applique from Gold Glimmer paper and also from Red Glimmer paper. The card base is a 5 1/2″ x 11″ piece of Cherry Cobbler cardstock scored at 5 1/2″ and 7 3/4″. Fold the base into a Z shape. Each panel of the Z is layered with Crushed Curry cardstock. The front cross-panel is a 1″ x 11″ piece of Cherry Cobbler cardstock scored at 5 1/2″ and 7 3/4″. I then layered a 7/8″ x 11 inch piece of crushed curry card stock over this piece. Fold it in the opposite direction of the card. So the long side is matched up with the short side of the card. Want more detailed instructions on making a Z fold card? Check out this video that i recorded earlier this year on how to make a Z Fold Card. Here are the supplies that I used for this card.